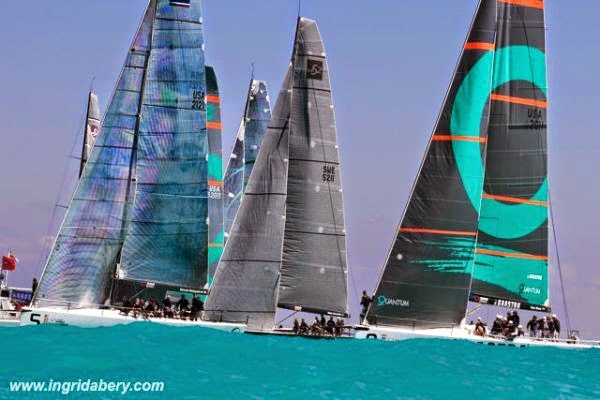 Racing at the Gaastra 52 World Championships off South Beach Miami had to be abandoned today, Thursday, when the light, fickle breezes proved too little to complete a fair race. Race 5 of the series was started and ran in very light, streaky and shifty conditions. After over an hour and within only 300 metres of the shortened finish line at the second top mark, Tony Langley's Gladiator was ahead of the pack when the time limit cruelly expired. Mark Blees' Gaastra Pro crew with John Cutler (NZ) calling tactics was on course for a second place - which could have been the best of the regatta so far - when the abandon signal was sounded. A short wait in the warm Miami sunshine followed before it became clear that there was little prospect of an increase in breeze and so the eight boat fleet was sent back to the dock. Several teams filed for redress in their belief that the leg length was not as it was supposed to be and that there were other procedural anomalies, but the International Jury dismissed the requests. Winds are expected to be more favourable Friday, the penultimate day of racing. As it stands championship leaders remain Ran Racing who lead by one point from Azzurra with Quantum Racing in third just one point back.